You know I love Niijima, don't you? We have been there so many times to enjoy living a slow life in nature. I've lost count. 10? 12? There is something magical about the island that brings us back again and again. Guru-guru Camp, our annual 2 week camping/hooping trip, is coming up again during Golden Week and we are scheduled to depart for Niijima on April 24th laden with tents and hula hoops. So of course, in the midst of preparations for that event, I snuck down to Niijima with one of my dearest friends and her family visiting from Australia. 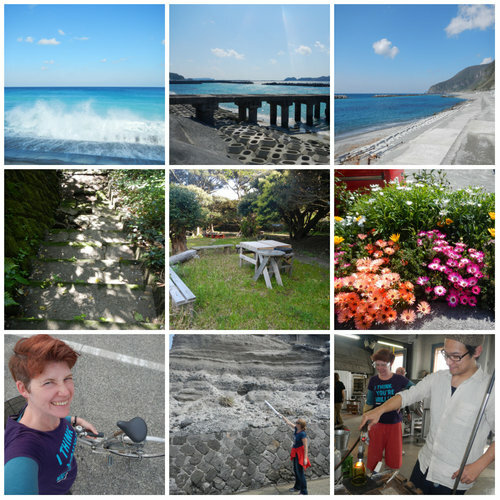 We toured around on bicycles (and I didn't hate it), soaked in the onsen, watched the waves, picnicked at camp, made glasses, and generally enjoyed ourselves enormously. It was hard to return to the city, even knowing that in a week, I'll be back! Between now and then, I have several days of tasks to catch up on, including all the camp packing, launching this year's WHD Dance tutorials and preparing a new project with Heather. I'll be frantic. It was worth it.